Have you ever wished you could take the time off to take that overseas trip? Or wondering how you could possibly swing a dream trip that’s still affordable? If you’ve had any of those thoughts, trust me you are not alone. I spent most of my college years dreaming of far off beautiful places and wondering not just how but WHEN I would be able to finally make the trips of my dreams. Today, I’m sharing a 2 part Travel Guide that I put together based upon my recent travels to Greece. 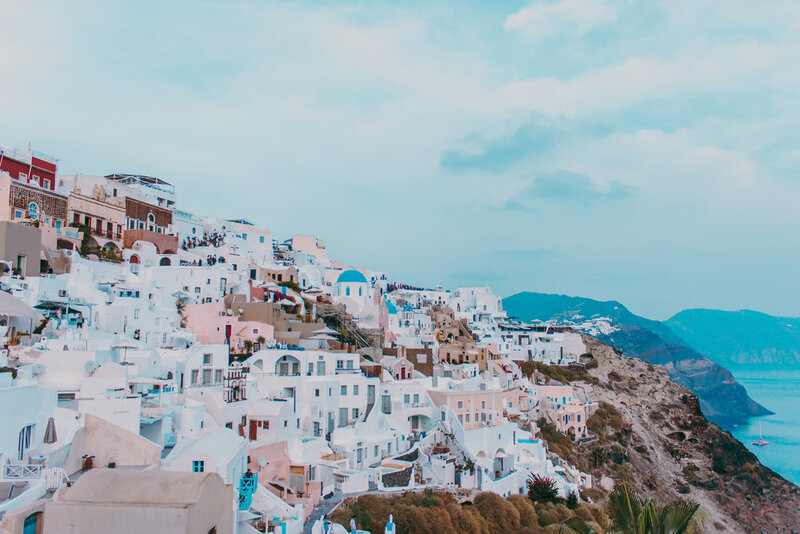 I’ll start with some details on my time in Paros, Santorini, and Athens, and then I’ll share the Travel Guide Checklist for traveling to Greece! If you’re looking for some tips on traveling abroad, interested in seeing some pictures of a truly beautiful spot in the world to inspire your next trip, how to score cheap plane tickets and accomodations, wondering what to pack, when to go, planning a trip abroad for the first time or are just curious about how to make a trip like this happen, read on curious traveller! We stayed for most of the trip in Drios, a village on Paros Island. One of the things that I loved about staying in the Cyclades was that other islands were just a ferry ride away. 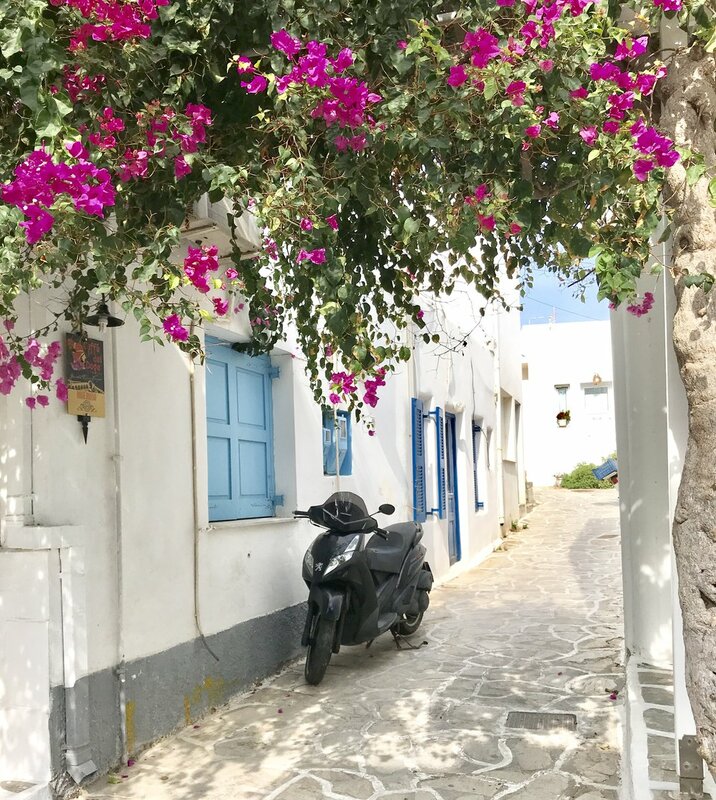 While visiting Paros, I highly recommend visiting Parrikia, and Nassaou- both are port villages on Paros, and Lefkes is a village in the mountains. Walk around the shops in Nassaou, and eat right by the port. Just remember that from 3-5 pm is siesta time for Greeks, meaning that most shops temporarily close for a break (or nap time) and then reopen around 8pm or so. 2 miles from the sea on a hill in Parrikia lies Ekatontapiliani, The Church of 100 Doors (Paros, Greece).Originally it was a 4th century temple to Aphrodite, the Greek Goddess of love and there are still original columns from. view of Lefkes- a mountain village on paros island, greece. One thing you can’t miss doing in Naoussa-wine tasting at Moraitis Winery. The servers were extremely knowledgeable on the wines and the cost of tasting is just 10 EUR! My personal favorites were the Moraitis Estate Assyrtiko (dry white), the Paros Red and the Paros White. What’s there to do in Antiparos? 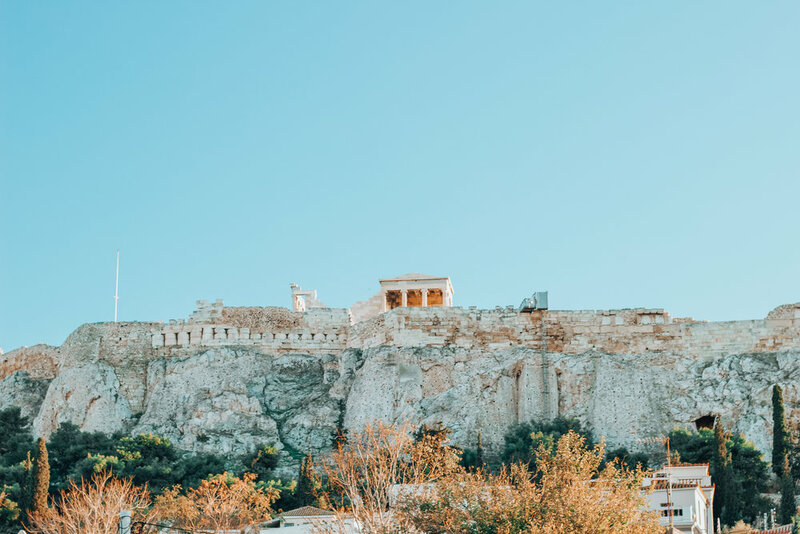 Here’s what you can’t miss in Athens! Visit the Acropolis, and while you’re there…. Walk around the Plaka neighborhood, shop, eat, drink, have dinner with a view of the Parthenon. Go to the mysterious Speakeasy bar! In Athens, we stayed at the Urban Stripe, a modern loft style apartment hotel right in Athens City Center. We had just 1 day to stay as we were flying back to the U.S. the next day. Talk about needing an expedited itinerary plan! Not only did they sit down and help us create a custom itinerary of places to see during our brief stay, but they also took care of arranging the taxi for our early morning departure the next day. I can’t recommend them enough. Our time in Athens was truly an experience and Urban Stripe was a huge help in making that happen. Just don’t forget to get it or to make sure that it’s not set to expire within 6 months of leaving the country. If you plan on getting a rental car in Greece, then you definitely need this permit. It’s $25 and you can get it the day you apply, as long as you go in person to your local American Automobile Association (AAA) or the American Automobile Touring Alliance (AATA). It’s only valid for a year, but Greece is one of the few European countries that REQUIRES you to have this permit for driving in their country. You probably won’t get pulled over, but if you’re pulled over without it you could be fined up to $1000 Euros. That would be one way to ruin a vacation fast. I am lucky to live in Houston, TX and right by a major international airport. If you don’t, consider leaving the country from a major hub. You’ll have more options pricewise. If you specifically live in Texas, CheapDFW is good and I highly recommend following Escape Houston on all social media and signing up for email alerts if you live in Houston. These deals are perfect for when you are prepped for your next adventure and have the means to snag ticket deals when they arise. Use a tool like the hopper app to watch for flights up to 1 year in advance. It is absolutely worth it with overseas flights to book travel insurance on your flights. Should your flights happen to cancel last minute you would be covered. Once we had our flight into Athens settled, we found a pretty cheap flight from Athens to Paros Island around $50 which is where we stayed for most of our trip. We could’ve taken a ferry, but the flight was definitely faster, cheap, and trust me, after the 14 hours of travel time we had we were ready to be there! 1 40 minute flight vs. 6 or 7 hours on a ferry? That’s a no brainer. 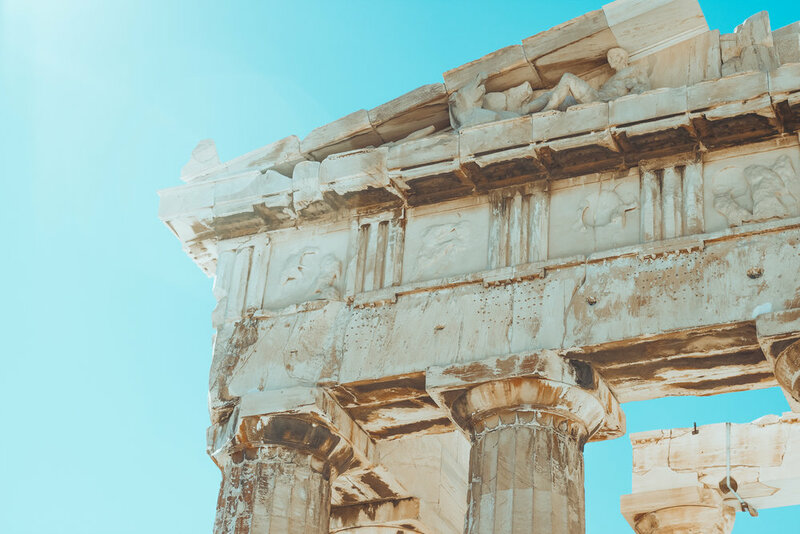 The best flight deals to the Greek islands (leaving from Athens) are always found when searching for flights leaving from major European hubs and by using budget airlines such as Aegean, and Olympic. The best time of year to go to Greece is Spring, Summer, and Early Fall. Santorini, for example is most touristy around June, July and August, which as everyone will tell you is simply overwhelming. If you go the 2nd half of May, September or early October like we did, you still get to enjoy nice weather but have less of an overwhelming tourist crowd. Scour airbnb for good deals. Like the Sundance Villa Cave House that we stayed at in Santorini. Read reviews, do the homework beforehand. Remember that time of year matters and how far you’re booking in advance for availability, and price. You could always try a hostel! I haven’t stayed in a hostel yet, but if you’re okay with the idea of hostels, they are extremely affordable and the absolute cheapest way to stay. Hostel rates can be as low as €12/night. Private rooms in hostels are also available for as low as €20/night. If you wanna do it like the locals do….Couchsurfing will be the way to go. Yes, if you haven’t heard of this yet, it’s EXACTLY what it sounds like. You connect with locals via the Couchsurfing platform and stay with them… for free. Just hope for the best and that they aren’t hiding a closet full of bones upstairs. Island hopping and day trips are definitely a vibe here! Find out the ferry schedule, and jet off to another island for the day! You can even drive your rental car onto the ferry so you can have transportation on another island! We took a ferry to Santorini and took our car on the ferry to Antiparos. Antiparos was only a 10-15 min ferry ride from our island of Paros, whereas Santorini was a few hours. Santorini is more of a destination spot anyways, so we stayed for a day and night there instead of heading back on that evening’s ferry. On our ferry to Santorini, we passed the island of Naxos which is another beautiful island in the Cyclades. We got a rental car at the Paros airport when we landed on the island of Paros, and walked on foot/took taxis when we were on other islands. Scooters and ATV are a pretty popular mode of transportation as well. You can book ferries in advance here and here. You don’t have to book them though, as you can pay when you get there. What you take all depends on the time of year. So make sure if you aren’t going during peak season that you pack light layers in case of cooler temps at night when you are out and about! How do I get Euros once I’m there? How do I exchange my unused Euros after my trip? Will my Debit and Credit Cards work? You may want to take a variety of payment methods just in case. Our Visa cards worked so we were able to get cash that way, but for example, my credit card was off and on. Just don’t rely on one form of payment and you’ll be good! What’s my absolute best piece of advice for visiting Greece? Try new things, wander into that little forgotten bookstore and grab a Greek stamp collection for 1 euro. Become a gyro taste tester in every city or island you go to. At every bar you go to, ask if they serve Meze (free finger foods) with their drinks. If a Greek invites you to share in a glass of Ouzo with them, know that it is an honor. Try an AUTHENTIC greek salad and know that it’s ok if you really didn’t like it all that much. Drink the champagne. Have all the wine. See the world. Maybe not just how it is now, but for what it might have been a time long ago. Try to take it all in and know that this experience is yours to keep forever.